Swiss photographer Madeleine Josephine Fierz has been stripped of two photography awards after it was revealed that she'd won them using someone else's photo. The contest-winning image, seen above, was taken by Thai photographer Sasin Tipchai, who had uploaded it under a CC0 license to stock photography website Pixabay. Fierz submitted the image as her own, ultimately receiving first place in the Moscow International Foto Awards (MIFA) and second place in the Fine Art Photo Awards. The deception was discovered after Sasin posted on Facebook about Fierz's use of his images, and someone else shared it with the Moscow International Foto Awards' Facebook page. That brought it to the attention of officials who, after looking into the matter, revoked Fierz's award and removed the image from its website. The image has also been removed from the Fine Art Photo Awards website. [Fierz] claimed since she bought these photos, she thought that she could manipulate it a little and claim it as her art. As a jury of MIFA we take these allegation very seriously and we investigate and delete images in question as soon as we can verify the facts. It’s almost impossible for us to know which images belong to whom unless photographers let us know, like you did. Swiss watch, Swiss knife and finally Swiss photographer! I hope Sasin Tipchai was then given the award, at least. This is a cliche image and it is taken by lots of tourists in a staged photo session. Nothing really wrong with that. It is a bit sad though that one of the tourists's images wins a photo contest. I remember one contest here at dpreview. It was an image from monument valley, I think. And it was an Indian on a horse in the image. And it won. Someone pointed out that this was a staged tourist image, taken by thousands of tourists, and that he had exactly the same image. That Indian guy came there almost every evening when the light was nice and the buses stopped there and maybe a hundred photographer took that very image at one event. Other than that - yes this Madeleine is laughing stock right now. Wonder how she explains this to her friends. What's your point? Staging or some form of it is involved in 100% of all photos. There is a difference in the terms staged and fraudulent. Bresson "staged" his photos in the sense that he went out on the street and knew what to expect in general. I arrive at Yosemite and expect to see Half Dome. Scouting locations is a form of staging. It is not a negative. In the case of the image above, I'd like to hear the photographer's explanation as to how much staging was involved. Otherwise, criticizing the photo because it was staged in some form seems petty. For me staged in a sense = profesionnal. You know your job and what to do and ensure it does happen. The contrary is supposed to be the eye of the photographer that catched the moment and this surely happen. But this doesn't make the photo superior. In all cases, staged or not, you need the eye of the photographer to make an outstanding photo. Anyway, the real power of a photo is was it express, what it make us feel and think, the emotions. Sure it being the reality can have a play in that like the photo of a key event we know is the reality. But this is also pure art. A photo that obviously is art can be manipulated and staged without any limitations IMHO. You can like or dislike the result, but there is no problems regarding photo-moral. If the photo depicts something, like a (natural) portrait a landscape a wild life picture a sports or news picture a street photo, something where we are lead to believe that what we see is the real thing, then staging and manipulation is a bit more sensitive. Enhancements, yes. Obviously lying, no. Of course, there is something in between. Many portraits are heavily staged. But, it is then kind of obvious. Not many just happen to have that weird studio props, like a stuffed leopard, around when someone takes a photo. Smoothing skin and other beauty stuff is also expected. Group photos are also staged. And I know that it happens that, in order to make all look good, a face is moved from one of the other taken photos. Oops! Border case. And what about an artsy landscape photo? You take it with a large format camera and make it look so Ansel Adams. How about removing the ugly tree? Maybe. How about adding a reindeer? Ehhhhh ... probably not. It is all about decisions. Unfortunately we probably do not all agree on the borders. Yes, Rick, be careful, johan is a self-appointed member of the Internet police. Don't cross him. Getty will sue them all... And probably win. didn't the jury and their establishment know about something called Google Image Search, where you can upload a photo and it can find its copies for you most of the time? When you see the image of the two kids in the water playing with the bird flying over head. You immediately no it's from the Indonesian area. Sometimes photo workshops are conducted, and everybody shoots the exact same shot. The question is who's shot is it, and should the shot have been used in a photo contest by anyone being that it is so public and generic. This is kind of like the Associated Press ,Routers and every other professional photo group shooting the same sports athletes standing at the podium. Who's shot is it really. We question. Should judging be in concept of the idea or actual shot if the same. Sorry, Glenn, but I don't follow your logic. This is not a case of two people shooting the same photo side-by-side; one shot it and the other bought it and manipulated it, then passed it off as her own in a photography contest. Not acceptable. As for the unrelated sports situation you mention: if we are side by side, shooting the same thing, and we take "the same" picture of a particular instant, I own the one I took, and you own the one you took. It's that simple. Never mind the fact that legally, they could not be "the same" picture. Even the slight difference in angle from us being side-by-side would cause every pixel to be slightly different from your photo to mine. Even if the angle, subject, and composition are nearly identical, the photos would be legally 100% unique. Yep. And the science is there to back you up George. 2 cameras side by side collect completely different photons on their sensors. So it is physically impossible, at the quantum level, to capture the same image twice. I set up a scene to shoot, and a tether computer. My scene. My equipment. Friend or client accidentally touches the tether screen and fires a shot. Or let's say I shoot from camera at same time friend touches tether screen. One file writes to my camera card, one file writes to computer tether. We each have identical files, and we have no way of knowing who actually shot the photo. Who owns the image? I remember that. Funny bummer. I'm still scratching my head! I asked my quantum computer for the answer, it said, 42...... the meaning of the universe. Well remember that there the copyright of the photo but you also need to take into account what is on it. So the client or whoever would own the photo he took. But I guess the ower of the buildings and other belongings on one side. The ower of the brand and so own maybe if they displayed in a specific way. The human subjects if they are a key component of the photo have all a word to say on it. And I guess the person that set up the scene if there was one too. No two photos are ever identical that requires the photographers to be on top of each other and shoot at the precise moment, how likely is that? The photo can be staged, so what! I would like to see two photos shot by two photographers of the same event at the same moment, they will never be the same. No one has the right to steal someone else's photo for any reason. Makes the contests and awards pretty much meaningless. Everyone is a photographer and the only people getting rich are the contest promoters and their cheapskate sponsors. I don't agree. most people can write also, (but by far not all are authors and making a living out of it) so skip book and writing contests as well? However the authenticity check gets harder and harder. It was always hard. Today it is easier to get something nice to steal from the internet, but it is also easier to check it from internet. Maybe she can start a photography channel on youtube ...something with chick. It is time to crowd source photo judging. Let the public be the photo police and call out the fakes and judge the winner. I believe the term is "appropriation art." My favorite part is this: ("Hey bro. I'm in Australia. I made the decision of spending a year travelling around the world in a van. I will cut off everything, including the internet, and I deleted my IG [Instagram]," he wrote. hats off to this guy for fooling people who should've known better the importance of doing your homework! Personally, I'm thinking,(yes I can ) since the 'Computer Age' and the thinking of people today. This is the, very, small 'Norm...' This is not something done just last week. This can happen any-time. There seems to be a lack of "pride", no ethics, or shame, only 'Ego'. ... Been at this Photo Career, for a very long time and had a great time doing it. Just lucky, I guess. ... Photographer not a job description - a diagnosis. In isn't clear from the post, but the image here isn't the exact one that was submitted. The submitted image is reversed and there is a boy on an elephant photoshopped into the background on the right side. Just thought I should add this since many here have posted that the original photographer should get the prize. Oh, and I should add that the photoshop job is so bad that any competent person judging a photo contest should have known. We are primates, and ironically the few who really understand that are the ones who think originally. The ones who refuse to believe we are related to apes seem to act the most like them. Look at The Voice and American Idol. Do original artists come on these shows and compete? Nope. It's all karaoke, with artists singing someone else's songs. And while there's nothing wrong with Karaoke, it's surprising that most people would rather watch that than original artists singing and performing their own songs. If the woman who submitted someone else's work received an award or prize that has monetary value, charge her with a crime. Why didn't they give the award to the Thai photographer? Image was winner after all! Sadly, for him, he didn't enter the competition, so there is no logic to his receiving the award. Should the photographer who came second be awarded First Prize? Even this could be debatable as that image wasn't thought worthy of first place. The knock-on effect of fraudsters goes beyond the initial action. We've recently seen a number of athletes being stripped of their medals following drug tests. Whilst this is belated justice, and the "clean" athletes got their medal upgrades, it robbed them of the joy of being presented with the medal at the event in front of the spectators and millions in the TV audience. We read about this a few weeks ago. lame. I've literally seen those shots on pixabay. They're great shots....but she's playing dumb. That’s really a sign of our social media attention-seeking times. Wanting an award (“like”) knowing you didn’t earn it makes no sense other than if there was a financial reward ... even then it’s wrong in so many ways. People didn't cheat in competitions before social media? surely social media means it is easier to spot and punish cheats? What would have been the chances of being caught stealing a photo from another continent decades ago? Knowingly well that they get caught, one fine day, people indulging in such shameless acts is totally disgusting! OK, but is that grounds for divorce? No grounds for divorce but definitely something else to slate her with....and justify the divorce. Yep, I solely based my divorce on this. No... She was a Canon and I was a Nikon so destined not to work out. Anyway, these photo prizes are often a vast joke ! How many times have we seen pictures with absolutly no value having been rewarded ? According to who and under which criteriums some junks are judged better than really original works ? It's often nothing but subjective at best. Is she Swiss? No wonder this happened. I met so many dishonest swiss people that I could generalize to the whole population now.. They always play innocent when caught. Seriously .... are you sure? Yep, pretty much sure. I am living here for 20+ years already. Have seen far too many examples of such behavior. Especially whenever there is a faint smell of money around. Of course I was not talking about your friends in a kindergarten and elementary school. I was talking about adult people doing serious business: drug dealers, weapon smugglers, robbers, pimps, prostitutes, street beggars, and especially about the worst part of that population: insurance agents, mortgage advisors, wealth managers. Those guys tend to be deplorable no matter what country you're in (the wealth managers, the others all have redeeming qualities). When I was in Gstaad to photo0graph beac volleyball World Championships, I suddenly discovered a photo I had taken a couple of years earlier in Norway, being used on t-shirts in a shop. I told the people in the shop that this was stealing, but the answered they had received the image for this use from the International Volleyball Federation. They had. And the FIVB never cared about photographers rights. If it wasn't for stolen Nazi gold, and dishonest secretive banking, Switzerland would be as poor as Albania. It's neutral, but pound-for-pound, is the biggest money launderer of ill-gotten war gains the world has known. Underneath the wafer thin pristine exterior, the place is the toilet of humanity. Plagiarising this awful Thai kitsch is really retarded. Like if you try and claim that a Dylan song was yours I'd understand (still stupid) but this is like you claim that you're the real Michael Bolton. You mean, like Dylan in his Noble prize speech? It is awful and eventually, especially in media, you get caught! Michael Bolton is a multiple award winning singer and songwriter (including a Grammy). I wouldn't mind having those credentials. By funny coincidence the first article I looked up to check on his awards says he does a pretty good Dylan impersonation. That about Dylan is pretty mindboggling. So I take that part back. Not Dylan then. Say Sam Cooke, Thom Yorke or Joni Mitchell. Still, this story really convinces me that fact is stranger than fiction. she used somebody else work and lied that she bought it (when she didn't as it was CC), somebody you just can't trust in the real world. Really annoys me, this plagiarism lark. Someone was using Thomas Shahan's wonderful macro photos on YouTube and claiming them as his own. He got caught out too. What burned me up, is that Thomas is a very modest person and has helped a lot of people get into that aspect of the hobby. Photographers should do themselves and our craft a favor by not entering these "competitions." In most cases the entrance fees only serve to enrich the organizers and the recognition provided to the winners is minimal at best. The photography industry movers and shakers whom the photographers hope will see their work do not take the contests seriously and neither should we. DPR, PetaPixel and other websites for photography enthusiasts should not be providing these contests with free advertising nor treat them as if they are reputable endeavors worthy of our attention. But to the photo itself, it is a staged photo done by the various photography workshops in Thailand organised by Nikon or Canon mostly, everymonth there is a grouo of about 30-40 people will get on a tour bus traveling to the country side for these workshop, the organiser would arrange some hired models, burn some smoke in the forest, hire some buffulos and elephans and any animals required for the shoot, the story they have created is always the same, it is like a package group tour. I went along once, seeing the kid had to tosh the bird (tight in a leash) in the air so many times makes me sick in the stomache. Normally the instructor would arrange for the group to one same position, then shout ACTION and the whole group would fired high speed shots away. Just have a look at the Original Photographer's webpage, you will see many shot that was staged, many of ny photography friends have the exact same photos. I was wondering why it was such an appallingly bad photo. It looks so staged I assumed it was a composite from different images. It's horrible rather than award winning IMO. The comment about staged pictures...so judges should be tuned in to this possibility and then you wonder, how does that type of photo receive awards? Says as much about the contest and the judges as the photographer and the thief! 90% of award winning photos are staged, including most of those strife shots from warzones. It seems the judges prefer these type of shots because they tell a story, which isn't surprising because thats what they're designed to do. The one time I went with the group, the moment they finish the setup and get ready for ACTION, I had the worse cringe in my life, and hope that I didn't participate, I just stand back and watch in complete disinterest, because I was expecting a tour of an old village to photograph some local daily life. But to most of the guys that went, it is their time to enjoy their '"artistic creation" with their expenisve toys. Does anyone hang back from the group, and get a shot of the (staged) shot in the making, with all the tourist photographers clicking away? There is inherently nothing wrong with staged photos. Lots of good, even iconic, photos are, more or less, staged. In particular portraits. Of course, one requirement, IMHO, is that it shall be evident that it is staged, or, maybe, that the photo is a reconstruction of a real event. Staging something and then pretend it was something for real is rather low though. In particular, if the staging has some kind of news implication. This has been done though. Not least in war times. More common though is to show a real event and claim that it is something else. That is really, really low. @Roland Karlsson nothing wrong with staged photos, in fact, a lot of photos are staged for various purposes, such as wedding, fashion etc and most of the stock photos on various websites, that was staged with intention, and can be clearly seen as such. The thing with the concerned photo was, seeing how obviously staged and cliche it is, that the swiss 'photographer' submitted it, with the caption such as if she had captured the scene naturally while she was traveling in the region, which fits your statement of "Staging something and then pretend it was something for real is rather low though"
wait...... there IS an elephant. She steals animals too. Hahahaha.. and that's not even a good photoshop. Really? The photo with the elephant looks amateurish in the extreme. I think justice would be to keep the prizes, but give to the real author of the pictures. There must have been -- and there will possibly be -- uncaught cases. I am glad I do photography because I like it and I buy gear because I can afford to. Photography is my private pastime. I'm not desperate to "be somebody." Trying to fool the judges in a contest will get you nowhere. Trying to fool the Internet population may get you somewhere, but you will lose something inside of you... Honesty and Integrity. Trying to fool an entire country will get you a four year stay in the White House. Dennis tennis: Nah, She lost. @The Jacal, why isn't she in jail? 9 months and she's still walking free. Shame on Trump. I thought he hired the best people and the best should have her in shackles by now. Aslo, Obama should have been deported by now. Shame shame shame. Trump has to hire better people. I've never seen people so polarized over politics. Its frightening. @cgarrard. There is only one truth and it is mine. Anyone who disagrees with me are traitor to humanity, Devil worshipper and must be punished in the most extreme manner possible. It is not politics, it is a way of life, of following the one true path, the path of the righteous. Trump has been chosen to be God's representative on Earth. We owe him everything. We catch people all the time in the forums submitting photo's taken by others as their own work. Then maybe it is a bigger deal than first thought! I can think of a few reasons why claiming another person's work is wrong. Why does it take a whole 5 days for DPR to reprint an article from petapixel? On the other note, why would DPR publish materials already available all over the net for days? Aren't they telling us they have little time to do the equipment testing? Because of people like me that don't read that website, perhaps. This is the first I heard of it. Thanks DPR. DPR has started churning a lot of (crap) news. Do we really need an article about how a minor brand has released a minor upgrade to an obscure product line? Advertising needs to be marked as such, instead of passed of as editorial, and the news content needs to be monitored and the crap filtered out. DPR used to be a review site, but they are doing fewer reviews nowadays than IR. Instead they reprint mostly stale information from the web. It is weird how DPR is like an echo of Petapixel. This is a fascinating dilemma. There is nothing morally wrong about creating photo collages with CC0 images. That is precisely the intended use of CC0 images. The question is, what were the rules of the contest? Were photo collages allowed? If not, this should have been clearly stated in the rules. If it was, then this "photo collagist" broke the rules. Photo collages are not a new product of the digital age. They've been produced since the dawn of the camera (see "Faking It: Manipulated Photography Before Photoshop" by Mia Fineman). As for Madeleine Josephine Fierz's manipulated (barely) entries in this MIFA contest, it does appear that there was deception involved on her part, but without seeing the contest rules, I cannot judge. What I can see is that she did not push "her" images much beyond Sasin Tipchai's original captures. Because of this, I question what was her intent? It clearly was not a visual intent. Thus, is she making a conceptual point, not unlike that of Marcel Duchamp's urinal, "The Fountain"? Is she questioning ideas of originality in art, in an age where millions upon millions of photographs flood our computers, our phones, our newspapers and magazines, our billboards, the very packaging that every product is wrapped in? Brings to mind Walter Benjamin's piece "The Work of Art in the Age of Mechanical Reproduction." I wish I hadn't stumbled into this, since curiosity about the work of someone prepared to do something that immoral in order to win a prize took over and dragged me into a veritable googling nightmare, where I have witnessed photoshop "fine art" so abominable that it will haunt my dreams for a long time. Google at your peril: certain things, once seen, can not be unseen. I'm not feeling inclined to criticize harshly. The story lacks some detail for me that make it hard to get a true sense of balance. The award seems to be called a 'Foto Award', rather than a Photography award. The difference may be subtle, but is enough for me to want to understand more of the missing facts before letting an opinion set in. As far as can I tell, she legitimately acquired the rights to use the image, she edited and added to the image and submitted the finished composition as her own. Was compositing allowed for the competition? I don't know. If allowed, did all elements have to be the original work of the entrant? I don't know. In the absence of a fuller understanding, I'm not feeling the need to shout Guilty! Off with her head! Oopsie. Did I just plagiarize Lewis Carol? Well, if the jury found her guilty, she probably is. They do not define the term photography and am not sure they should. There's been a healthy debate over public domain photographs (or fotos?) so I will not bore you with that. Instead would like you to switch places with Mr. Tipchai for a moment. 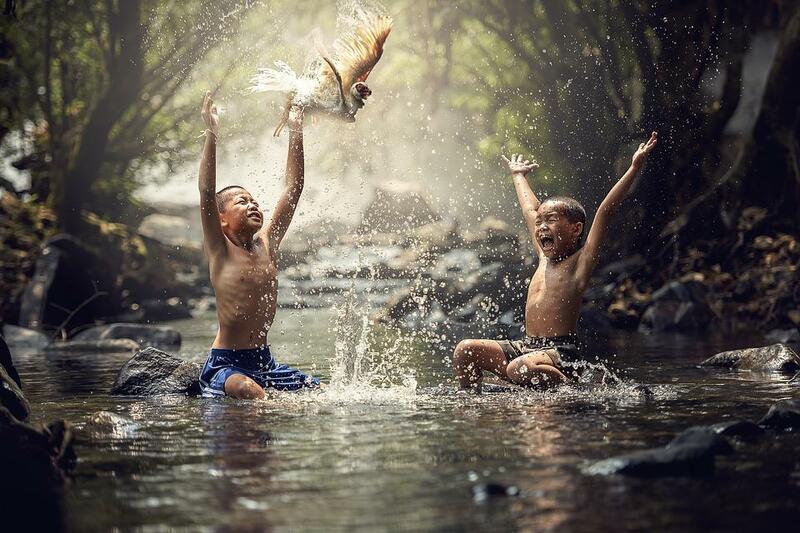 Imagine you actually took the shot of the kids playing in water and then someone borrowed the image and won an award. Would your ethical relativism be same? Would you still post pictures online? Under copyright law she is an infringer. If there was a pre-existing copyright registration, she would be at risk for statutory damages up to $150K. "taken by Thai photographer Sasin Tipchai, who had uploaded it under a CC0 license to stock photography website Pixabay." What is a cc0 license? "A Creative Commons (CC) license is one of several public copyright licenses that enable the free distribution of an otherwise copyrighted work. A CC license is used when an author wants to give people the right to share, use, and build upon a work that they have created." "build upon a work that they have created" - Personally I think what Fierz did qualifies under this definition because I find the original somewhat unfinished, and her version to be a more complete image. The question therefore moves on to whether the submission was in breach of the competition rules. But the is no mention of this at all in this article so we simply don't know. The statement issued by the MIFA Jury seems to be saying that Sasin is now reclaiming this modified work as his own and they have accepted this. But it's all very far from clear to me. But he didn't register copyright. He gave the copyright away under level '0' of Creative Commons. "no copyright reserved". He has no case to stand on. In fact, according to what @Najinsky says above, it may appear that he then broke his agreement. Namely: 'the copyright holder will not take any actions that prevent a user of the work from exercising rights consistent with the intention of the copyright holder as expressed in CC0'. Naughty. (Btw, this is a genre of photography known as Thai kitsch). This style came from HK photographer, call pictorial. In Thailand we eat a dream for reality. What is that thing in the top? Is the kid swinging a bird around? Oh, and the con artist's "new work" is terrible. Maybe just caught some kind of waterfowl and celebrating they are going to have something more than rice and vegetables for dinner that night. That's why I disagree with your assessment of the composite version. For me, the addition of the onlooker (on the back of the elephant) adds to the sense of 'what's going on here'. It's like he's thinking the same thing and so allows me to relate to the 'enhanced' scene more than the original. To me it looks like a monkey. Instead of stripping the awards to the Swiss photographer, they should have given the awards to Thai photographer Sasin Tipchai. After all, it's his/her photo that "won" the awards regardless who submitted it. It would create a precedent that subsequently requires them to always give the award to the creator instead of the submitter and hence determine the true creator, and also to give the award to someone who didn't enter the competition nor agree to its terms. They probably don't want to open that can of worms. Good points. Yeah, you are right. I was just about to post the same thing, word for word. It's the photograph that won. Sasin Tipchai should be given the award - entry fee generously provided by the cheat Madeleine Josephine Fierz. Shameful what some people will do. Brought to you by the Richard Prince school of photography. I'd be interested in what the "unedited" original looks like. Haha, that photoshopped elephant is hilariously bad. I think the original image - 'Thai kitsch' or not - is actually rather nice. I'd be really proud of myself had I shot it. Can't wait for the brave-new-digital-world peanut gallery to tell us how lucky Mr. Tipchai is for having his work stolen. After all, he now has exposure. And next time he wants to buy a lens, he can use this wonderful new currency at B&H. I hear they give "exposure" discounts all the time. I can't tell what I'm looking at -- up by the kid's hands. It looks like maybe a bird, but, I can not resolve it. So, what is it, and, is it something that the faker added as an "enhancement" to the stock photo that she "bought?" "Sampling" (appropriation) has become commonplace in music. This is done by many "artists", especially hip-hop. This ethic is also appearing in "fine art". The notion is that modification of existing work(s) constitute a new "work". The dictum that "information wants to be free" is coming to photography. Or has already arrived.